Few non-Chinese can claim the odd distinction of having forged a favoured political catchphrase of the Chinese Communist Party. But British psychologist Richard Wiseman may have done just that, thanks to the 2012 publication of his self-help book Rip It Up, rendered in Chinese translation as Positive Energy. “Positive energy,” or zhengnengliang (正能量), is now at the very heart of political discourse in the Xi Jinping era, having direct implications for media and Internet control, and extending to international diplomacy and other areas as well. And Lu Wei, the director of the powerful Cyberspace Administration of China (CAC) — under the Xi Jinping led Central Leading Group for Cyberspace Affairs — has played a critical role in conferring these “extra levels” of meaning. The first public use of positive energy as part of the Communist Party’s mainstream political discourse came one year ahead of Lu Wei’s roundtable address in London, when he served as minister of propaganda for the city of Beijing. At a discussion forum on September 3, 2012, called “There is a Spirit Called the Beijing Spirit,” Wang Danyan (王丹彦), deputy section head of the Propaganda Management Division of what was then still SARFT (now merged with the General Administration of Press and Publications), voiced her approval of a TV drama called Beijing Youth (北京青年), saying dramas of its kind “transmit positive energy to society.” The need to spread positive energy as a matter of propaganda policy was a central theme of that forum, where Lu Wei, who would soon rise to a new and powerful post as head of the CAC, was the most senior official present. “Positive energy is meant to give people confidence and hope, encourage people to love their country, society and life, as well as to pursue nice things. Everything we do is ultimately for the sake of spreading positive energy. Positive energy knows no boundaries. If everyone were to spread positive energy on the Internet, the world would be a much better place. Tomorrow, China will host its second World Internet Conference (WIC), actively promoting its vision of cyber-sovereignty as it dangles the fat carrot of its domestic Internet market before global tech firms. Lu Wei and Xi Jinping will no doubt speak again about the imperative of order and freedom, of the restraints needed to save us from ourselves. “Freedom is our goal; order is our means,” Lu Wei said at his pre-WIC press conference last week. [We must] focus on our grasp of the “online army” programme. This means that with the demand of “consolidating and expanding the [pro-Party] red zone (红色地带), transforming the [unaligned] grey band into red band territory, and courageously engaging in struggle within the black band (黑色地带)” , [we must] build a powerful “online army” that we can utilise, winning the online battle for public opinion . . . The characterisation of unwelcome viewpoints in the online sphere as “the black band” is chillingly reminiscent of ideological struggles in the Chinese Communist Party’s past. 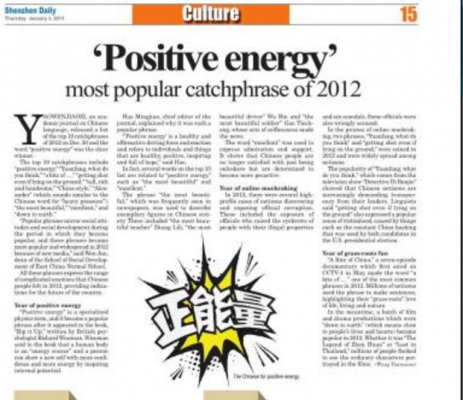 As we’ve been saying for some time now, “positive energy” is a Party catchphrase to watch — not only for its mobilisation in the arena of press and Internet control, but also for the way it strikes a different tone among CCP terminologies. 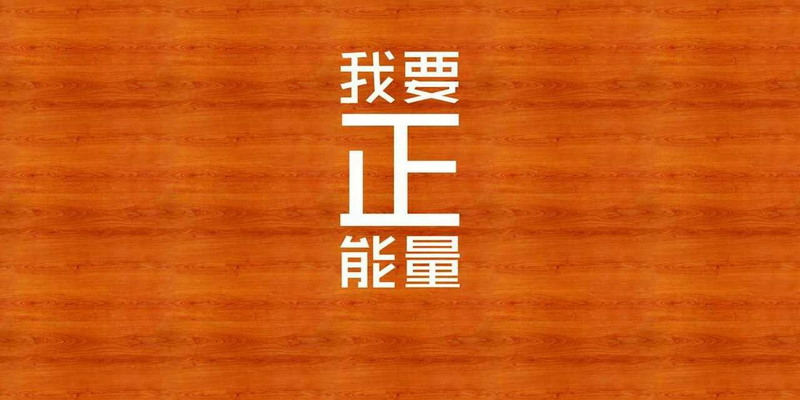 For more on this catchphrase we direct you to a recent piece by former China Media Project fellow Zhang Ming (张鸣), a professor at Renmin University of China. In tracing the origins of the super-popularity of “positive energy,” Zhang goes back to the 2012 film Beijing Blues, which is possibly indebted to Wiseman’s book.